In Which We Bring You Stories Relating to Christmas and/or Coffee and Shamelessly Self-promote Our Company and Goods. The Story of The One Ring as Told by Someone who Can’t Discern the Difference Between Lord of The Rings and Harry Potter. In a hole in the ground there lived a hobbit. His name was Bilbo Baggins. Bilbo had just been asked by Gandalf to go on a quest with the dwarves to the Lonely Mountain when in walked Dumbledore. Gandalf blew a smoke ring. “But I have an adventure that I need Bilbo for.” said Dumbledore. Bilbo glanced back and forth between the two wizards not sure what the Mordor he was supposed to do. “Oh, of course, I meant the snake one. Do you mind if I steal Bilbo real quick?” asked Dumbledore. The next minute Dumbledore and Bilbo stood in the center of a cold and dank cave. “What are we doing here?” asked Bilbo. Dumbledore and Bilbo crept around the slippery rocks and foul smelling pooled water. As they crept around a large boulder that looked like a dementor, they saw him. The creature Gollum with a Hario Kettle and a Bee House Dripper making Charming Beard Coffee. He was wearing suspenders, a knit cap, and sporting a handlebar mustache. Dumbledore moved quick. “Acio Bee House Dripper!” And the dripper flew out of Gollum’s reach and into the hands of Dumbledore. “Quick!” said Dumbledore. Bilbo grabbed his hand and they apparated back to the Shire. The next morning, after Voldemort yawned loudly and slapped his cheeks a couple time to get his evil grin going, he went into the kitchen to make himself a pour-over. He ground some Charming Beard Coffee (it wasn’t particularly evil, but it was damn good coffee), but as he went to summon the dripper he couldn’t do it. In a flash he realized what ha happened. His precious was stolen. It took him two boxes of tissues and a dozen donuts to cure his depressed spirit that morning. He didn’t even know if it was worth it to keep doing evil. Not without his morning coffee anyways. Do you like canning? Or embalming tiny octopuses in formaldehyde? Well then, have we got the gift for you. Presenting: Drum roll please, bah da bah da—the ever so sleek and modern glassware from Weck Jars. (Never mind about the drum roll, it didn’t quite work). Weck Glass jars are a perfect way to store your goods with the same air tight technology aeroplanes use to keep passengers safe inside. AND, you can look at it, because it’s made of, well, glass. They’re perfect for canning tomatoes or toes or keeping your Steel Cut oats nice and fresh. Also, coffee. They are excellent storage containers for keeping coffee fresh. Why? You might ask, my dear Watson. Well because of the whole airtight thing. It keeps the coffee just a tad bit fresher than a bag that’s been opened. Only one thing to be aware of though—it is a good idea to keep the glass Weck Jar in a cupboard or a pantry or in a somewhat dark place so you are not exposing the coffee to a ton of sunlight. Coffee originates from the Pacific Northwest and it is not used to sun the way people from California are. It’s back tends to get as red as a lobster. So if you have the money and feel like being a good American consumer (and supporting small business) check our the Weck Jars on our website (they come with coffee). 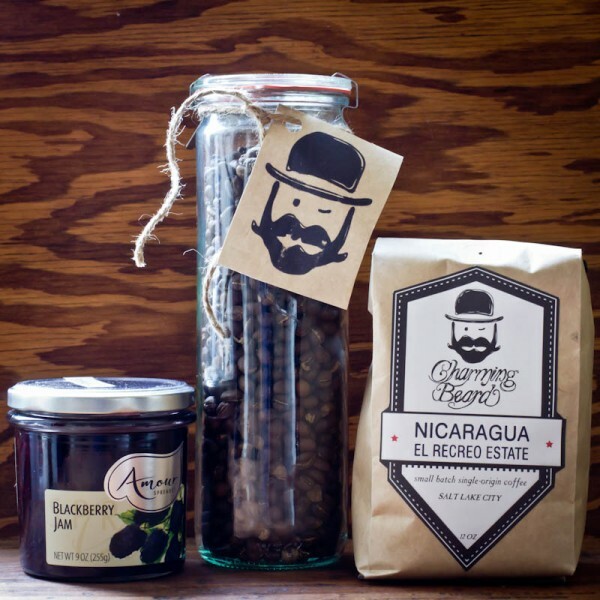 On the Twelfth Day of Christmas My True Love Gave to Me, the Charming Beard Holiday Basket Which Includes a Bag of Charming Beard Coffee, Uganda Coffee in a Weck Jar, and Amour Spreads’ Blackberry Jam, and also, a Partridge in a Pear Tree. “Do you realize that Christmas is only twelve days away?” asked Justin. She kept brushing. Jamie had always loved her black hair. It contrasted nicely against her extremely pale and lucid skin. For years she had been ashamed of how pale she was. Part albino, kids used to tease her. But now she saw it as a sign of beauty, like a Snow White sort of beauty. And the other kids in her high school were beginning to think about her like this as well. Justin was gazing intently at Jamie. Ever since they shared a chemistry class in the tenth grade at Fillmore High last year, Justin had wanted to be Jamie’s boyfriend. He felt extremely lucky to be sitting here, next to her, on her pink and white bed. He was going to propose that they go Christmas shopping this weekend. While they were Christmas shopping perhaps they would hold hands. Or go out to dinner afterwards. “I don’t even know what to get for everyone,” said Jamie. “I know. Well, maybe…you know, you and I could go to the mall this weekend. Do our Christmas shopping together,” Justin smiled desperately. Justin gulped inside. This was not sounding good. “Not really.” Said Jamie, getting a sour look on her face. All of a sudden, Justin leapt up in the air. “That sounds too good to be true!” said Jamie. “Ill go call.” Justin went outside. After he made the order he went back in. “You’re so great.” Said Jamie, gazing at Justin with a sparkle in her eye. Justin went to go sit by her. And then, she kissed him. Oregon Chronicles: A PDX Christmas in the Year of Our Lord 2018.